Fed up with poor behaviour? This is your chance to have a big say! Cornwall v Durham - important change to note! Pre-Season Friendly - Thursday 15th July! CCFA disappointed with response towards "Behaviour Working Party" meeting suggestion! 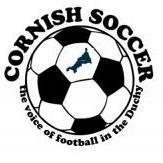 Cornwall Youth v Guernsey Youth / FA County Youth Cup. Tony Woodforth - Mevagissey FC R.I.P.